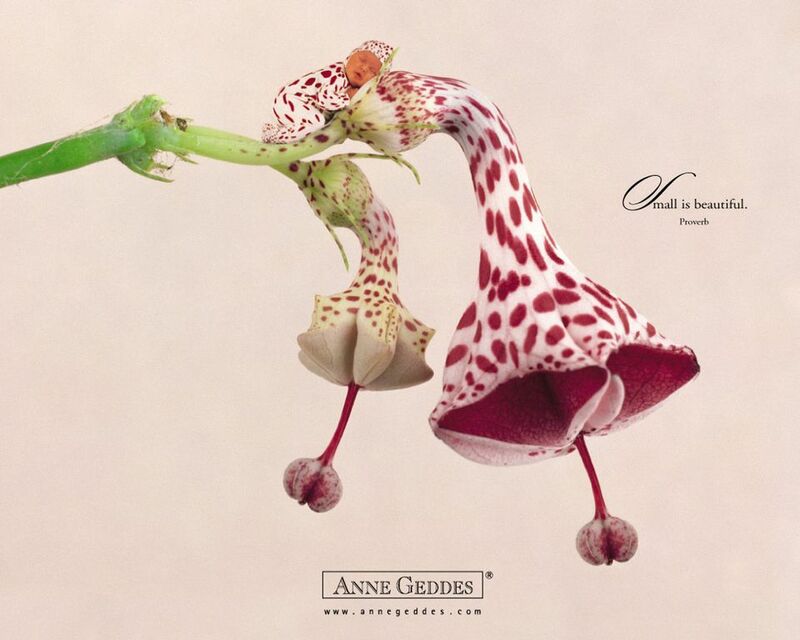 No photographer has transformed baby photography quite like Anne Geddes. Her adorable portraits of babies in angel's wings or lying in a blooming flower have made her name one that is recognized throughout the world. From greeting cards to calendars, Geddes' photography is sold worldwide and her style is very distinct. Few portrait photographers can claim such fame and attention, and her commercial success has made Anne Geddes one of the best-known modern photographers. Geddes was born in 1956 in North Queensland, Australia and has two daughters with her husband. Geddes was the middle of five girls and grew up on a cattle ranch in North Queensland, Australia. As a child, Geddes became fascinated with the "Gumnut Babies" by May Gibbs and those images heavily influenced Geddes' later work. Her first job with a New Zealand hotel chain led Geddes to fall in love with photography. Photography was put on hold, however, as she progressed through traditional jobs. After returning to photography in the early 1980s, Geddes began in her current style, and around 1986, she became familiar with studios. Geddes opened her portrait studio around 1988 in Aukland, New Zealand. It was during this time that her work began to take the distinct direction that she is best known for. It began in 1991 with a simple portrait of twin babies, Rhys and Grant, sitting in giant heads of cabbage. The now famous photograph is titled "Cabbage Kids" and it launched her career worldwide. Anne Geddes primarily photographs babies. Rather than standard portraits, Geddes photographs the babies in cute animal, insect, and flower costumes, then digitally merges the images with flowers or other natural scenes to create unique and adorable photographs. Geddes' images have a very distinct style. They are often simple, filled with bright colors and soft light, and natural expressions on just one or two babies. The children become part of the fantasy world that Geddes creates. She will often envelop them in flowers, adorn them with fairy wings, or photograph them sleeping peacefully in anything from a single rose to a pile of leaves. Although some of Anne Geddes' photographs require a tremendous amount of tedious setup in the studio, she is committed to keeping her studio kid friendly. Instead of insisting children continue to pose until they are in tears, Geddes takes disappointments in stride. For example, out of fifty-five children posing as worms for "Down in the Garden," not one of them yawned during the sessions - a shot Geddes dearly wanted. Rather than keep pushing or trying tricks to get the babies to yawn, she just let it go. If there is a single photographer who has reshaped the idea of baby portraits, it is Anne Geddes. Her books, greeting cards, and calendars have served as an inspiration for a new generation of portrait photographers.